Rockport Gray which is deep and warm with slightly purple undertones. Sandy Hook Gray, which is a lovely green-gray and the one I’m leaning towards. Sea Haze, which is decidedly more blue. 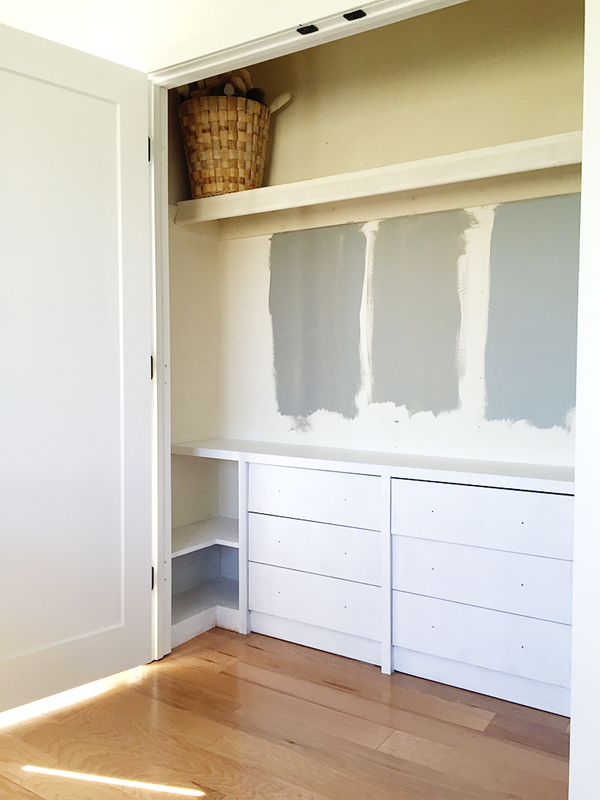 Since our whole house is white, my plan was always to go bolder in the closets…but now I’m hesitating. I have to confess, in my own home I’m a dark/accent wall virgin and now that the swatches are up I’m second-guessing myself! What do you think? Should I go bold or go basic and just paint it all white? I’m seriously giddy because now we have so much more storage! I was actually able to fit Clinton’s entire book collection on just one side, leaving room for lots of toys on the other. 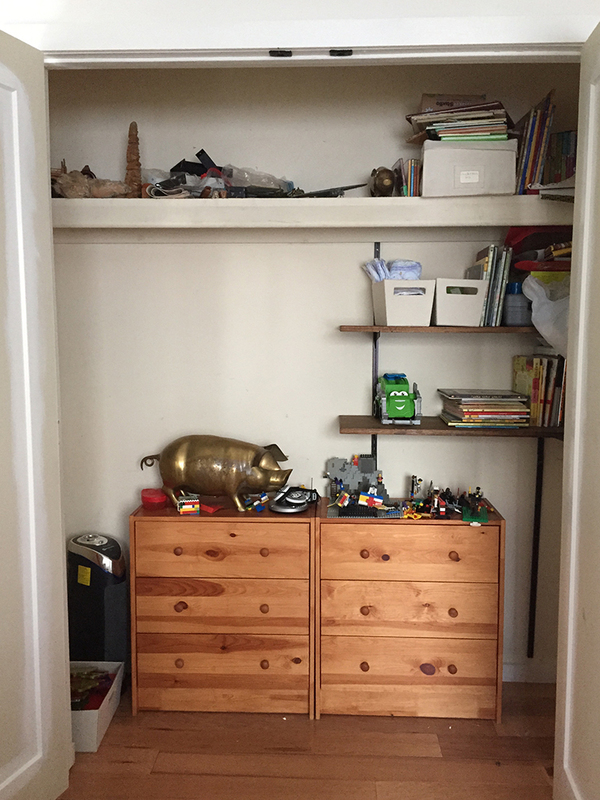 In fact, we have so much storage I’m thinking of taking down the shelves in the room…shhhhh. Sanded plywood sheets*, 3/4″. 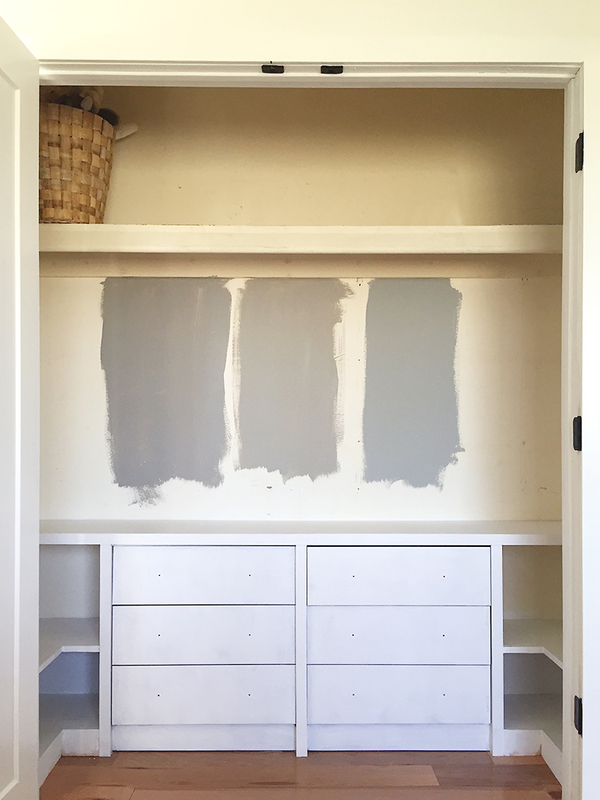 I used these to cover the sides of each dresser because the baseboard created a gap and because I wanted the side trim to be equal in width to the center and top trim. White melamine board*, 3/4″. This was the best option for the top board, which had to span 79″. Veneer edging tape* to cover the edges of the plywood shelves. 1/4 x 1 3/8″ pine lattice moulding for the top, sides, and middle trim. Scrap wood for the shelf supports and base trim. 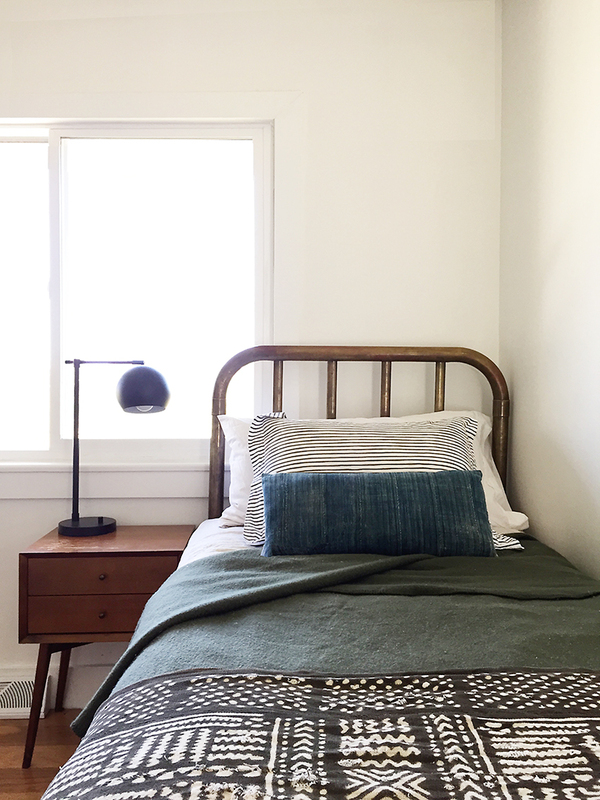 In other news, I picked up the Target lamp*, the replacement rug arrived, and the lovely vintage indigo pillow from Boho Pillow came in! Excuse the iPhone photos please, but I’m saving the pretty photos for the end. That pillow is awesome though, I love that it is very subtly striped and a more muted blue, plus it ever-so-slightly reminds me of denim. Actual denim I wouldn’t be a fan of, but this is just enough ‘little boy’ for me while still fitting with the rest of our house. Monica’s Etsy shop is seriously my new favorite pillow source, I feel like I’ve been using it for every new client! 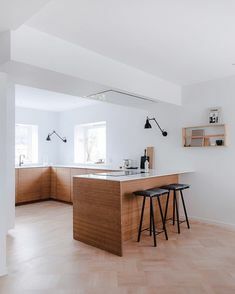 (Like this room’s vibe? 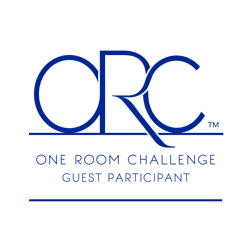 Find out more about my e-design services). And oh, that lamp! I ordered it online for in-store pickup and as soon as I saw it, I was like THAT THING IS ENORMOUS. I actually brought it up to the return desk before I even took it home. But I’m glad I did take it home, because once I put it on the dresser it was really the perfect height and scale. My favorite part is the matte black finish…as always, I love you Target! Here’s a sneak peak of the rug…I have to leave something for the big reveal! This week is going to be all about finishing that closet, and then I can finally focus on the rest of the details in the room. I’m still looking for a good hanging planter so if you have a favorite, let me know! *Denotes an affiliate link. Thank you for supporting the brands that support Annabode + Co. and allow us to bring you new content and inspiration! you did a wonderful job with those dressers! it looks so good. also, I’m casting my vote for sandy hook gray. Thanks Madeline! That’s my favorite too :). what about blackboard paint in the closet? just on the wall bwteen the built ins and the top shelf?–drama and fun! and you could do black or that classic green school room color which would totally fit your palette? I don’t know why this is showing all caps–I don’t even have caps lock on! Someone else suggested that, but that back wall is out of his reach unfortunately. Thanks for the idea! I love this so much, Anna! You always rock it. Also, I love a surprise bold closet. Thanks Julia! That’s good to hear, I guess I just need to work up my courage haha. Those greys will all look super chic! If you end up hating the color, you can just close the doors, haha. So what’s in the closet now is those two dressers? Wow! Way to go. It looks amazing and very functional. The dressers look great! And I love all the colors and patterns on the bed. So good! Oh yeah definitely go bold in the closet, the doors will be closed most of the time anyway and it’s a fun thing to have in a child’s room. Sandy hook grey is my personal vote. It’ll look great and I’m sure you won’t regret it. True! It’ll be like a fun surprise. Thanks so much for the input! Holy Crap. that built in closet is awesome!! I like the idea of doing something fun/ bold on the closet walls. Amazing work!!! Please please pick a color for your closet – it will make the brass knobs stand out even more! Loving this room so much. Thanks Kourtney! I went with color but with a twist, more to come on Thursday! I love a good built in and this closet is great! can’t wait to see the whole room come together. 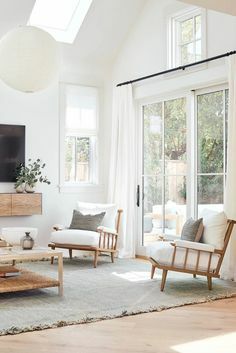 Love everything about this room! 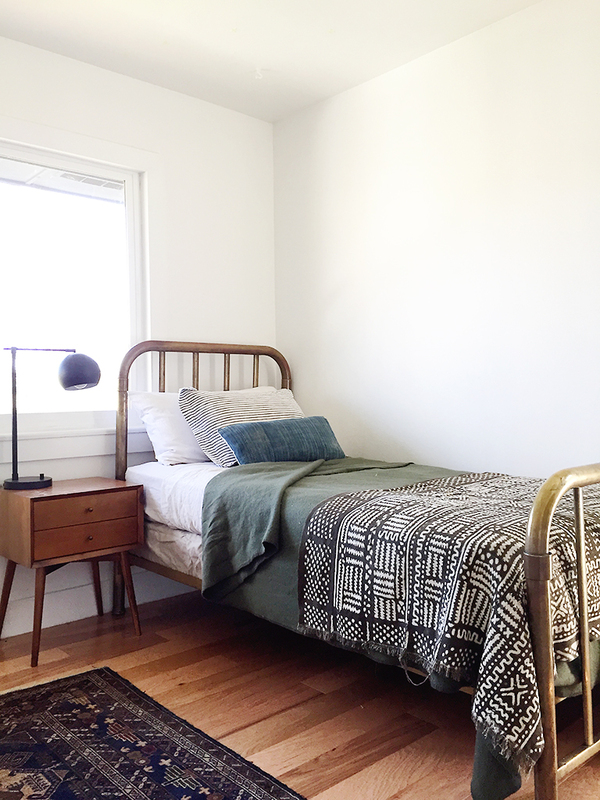 The midcentury nightstand is perFect with the brass bed! Thanks Kemley :) It’s coming together! Thanks Ellie! It’s all painted now, stay tuned! I’m having trouble finding the finished closet. I never posted it, sorry!